The most common type of volcanic eruption occurs when magma (the term for lava when it is below the Earth's surface) is released from a volcanic vent. Eruptions can be effusive, where lava flows like a thick, sticky liquid, or explosive, where fragmented lava explodes out of a vent. 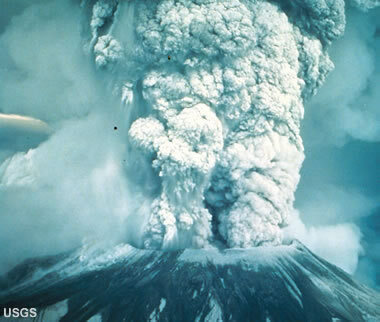 In explosive eruptions, the fragmented rock may be accompanied by ash and gases; in effusive eruptions, degassing is common but ash is usually not. In a Hawaiian eruption, fluid basaltic lava is thrown into the air in jets from a vent or line of vents (a fissure) at the summit or on the flank of a volcano. The jets can last for hours or even days, a phenomenon known as fire fountaining. The spatter created by bits of hot lava falling out of the fountain can melt together and form lava flows, or build hills called spatter cones. Lava flows may also come from vents at the same time as fountaining occurs, or during periods where fountaining has paused. Because these flows are very fluid, they can travel miles from their source before they cool and harden. Hawaiian eruptions get their names from the Kilauea Volcano on the Big Island of Hawaii, which is famous for producing spectacular fire fountains. Two excellent examples of these are the 1969-1974 Mauna Ulu eruption on the volcano's flank, and the 1959 eruption of the Kilauea Iki Crater at the summit of Kilauea. In both of these eruptions, lava fountains reached heights of well over a thousand feet. Strombolian eruption. Short bursts of glowing lava, created from the bursting of large gas bubbles at the summit vent of a volcano typify a Strombolian eruption. This photo, taken from the summit of Stromboli, a volcano in the Aeolian Islands, Italy, shows a classic example of this activity. Photo copyright iStockphoto / Andrew Hague. The crystal and gas content and temperature of a magma help determine a volcano's eruption style. -- Crystals in magma make it more viscous, so magma with a high crystal content is more likely to explode than flow. -- Gases create explosions if they cannot easily escape from viscous magma, but they can also be released without explosions (or with only minor ones) from fluid magma. -- High-temperature magmas usually erupt effusively, while low-temperature magmas cannot flow easily and are more likely to erupt explosively. Strombolian eruptions are distinct bursts of fluid lava (usually basalt or basaltic andesite) from the mouth of a magma-filled summit conduit. The explosions usually occur every few minutes at regular or irregular intervals. The explosions of lava, which can reach heights of hundreds of meters, are caused by the bursting of large bubbles of gas, which travel upward in the magma-filled conduit until they reach the open air. 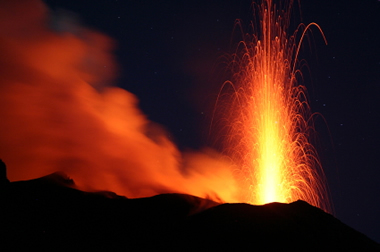 This kind of eruption can create a variety of forms of eruptive products: spatter, or hardened globs of glassy lava; scoria, which are hardened chunks of bubbly lava; lava bombs, or chunks of lava a few cm to a few m in size; ash; and small lava flows (which form when hot spatter melts together and flows downslope). Products of an explosive eruption are often collectively called tephra. Strombolian eruptions are often associated with small lava lakes, which can build up in the conduits of volcanoes. They are one of the least violent of the explosive eruptions, although they can still be very dangerous if bombs or lava flows reach inhabited areas. Strombolian eruptions are named for the volcano that makes up the Italian island of Stromboli, which has several erupting summit vents. These eruptions are particularly spectacular at night, when the lava glows brightly. Vulcanian eruption. Relatively small but violent explosions of viscous lava create columns of ash and gas and occasional pyroclastic flows, as seen at this eruption of the Santiaguito volcanic dome complex in Guatemala. Photo by Jessica Ball, March 15, 2009. A Vulcanian eruption is a short, violent, relatively small explosion of viscous magma (usually andesite, dacite, or rhyolite). 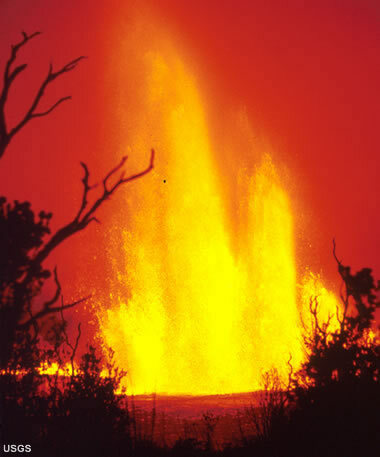 This type of eruption results from the fragmentation and explosion of a plug of lava in a volcanic conduit, or from the rupture of a lava dome (viscous lava that piles up over a vent). Vulcanian eruptions create powerful explosions in which material can travel faster than 350 meters per second (800 mph) and rise several kilometers into the air. They produce tephra, ash clouds, and pyroclastic density currents (clouds of hot ash, gas and rock that flow almost like fluids). 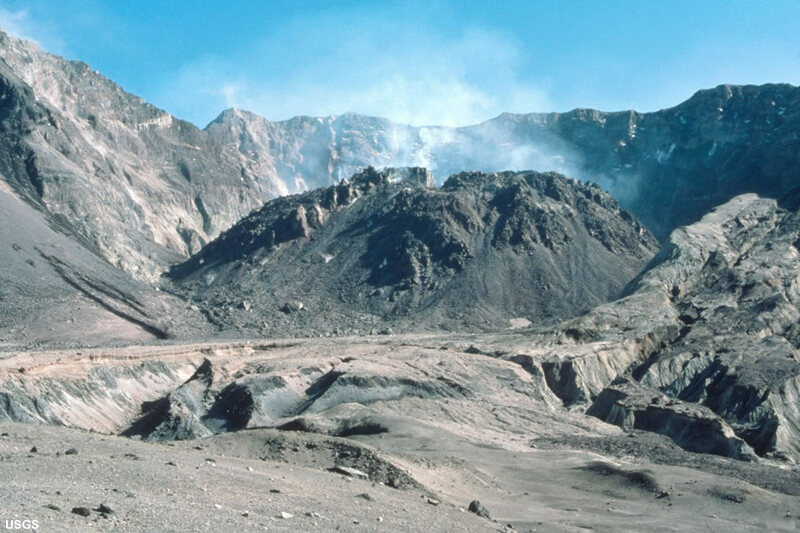 Vulcanian eruptions may be repetitive and go on for days, months, or years, or they may precede even larger explosive eruptions. They are named for the Italian island of Vulcano, where a small volcano that experienced this type of explosive eruption was thought to be the vent above the forge of the Roman smith god Vulcan. 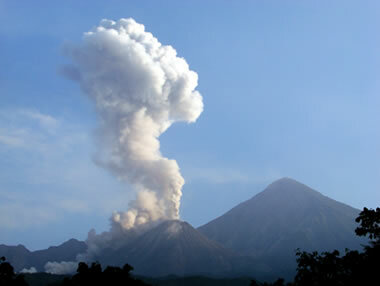 The largest and most violent of all the types of volcanic eruptions are Plinian eruptions. They are caused by the fragmentation of gassy magma, and are usually associated with very viscous magmas (dacite and rhyolite). They release enormous amounts of energy and create eruption columns of gas and ash that can rise up to 50 km (35 miles) high at speeds of hundreds of meters per second. Ash from an eruption column can drift or be blown hundreds or thousands of miles away from the volcano. The eruption columns are usually shaped like a mushroom (similar to a nuclear explosion) or an Italian pine tree; Pliny the Younger, a Roman historian, made the comparison while viewing the 79 AD eruption of Mount Vesuvius, and Plinian eruptions are named for him. Plinian eruptions are extremely destructive, and can even obliterate the entire top of a mountain, as occurred at Mount St. Helens in 1980. They can produce falls of ash, scoria and lava bombs miles from the volcano, and pyroclastic density currents that raze forests, strip soil from bedrock and obliterate anything in their paths. These eruptions are often climactic, and a volcano with a magma chamber emptied by a large Plinian eruption may subsequently enter a period of inactivity. Lava domes form when very viscous, rubbly lava (usually andesite, dacite or rhyolite) is squeezed out of a vent without exploding. The lava piles up into a dome, which may grow by inflating from the inside or by squeezing out lobes of lava (something like toothpaste coming out of a tube). These lava lobes can be short and blobby, long and thin, or even form spikes that rise tens of meters into the air before they fall over. Lava domes may be rounded, pancake-shaped, or irregular piles of rock, depending on the type of lava they form from. Lava domes are not just passive piles of rock; they can sometimes collapse and form pyroclastic density currents, extrude lava flows, or experience small and large explosive eruptions (which may even destroy the domes!) A dome-building eruption may go on for months or years, but they are usually repetitive (meaning that a volcano will build and destroy several domes before the eruption ceases). 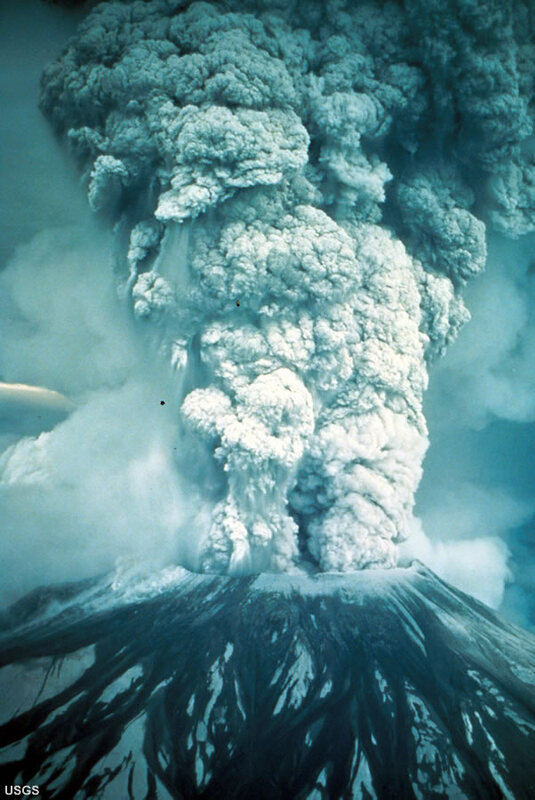 Redoubt volcano in Alaska and Chaiten in Chile are currently active examples of this type of eruption, and Mount St. Helens in the state of Washington spent several years building several lava domes. Surtseyan eruptions are a kind of hydromagmatic eruption, where magma or lava interacts explosively with water. 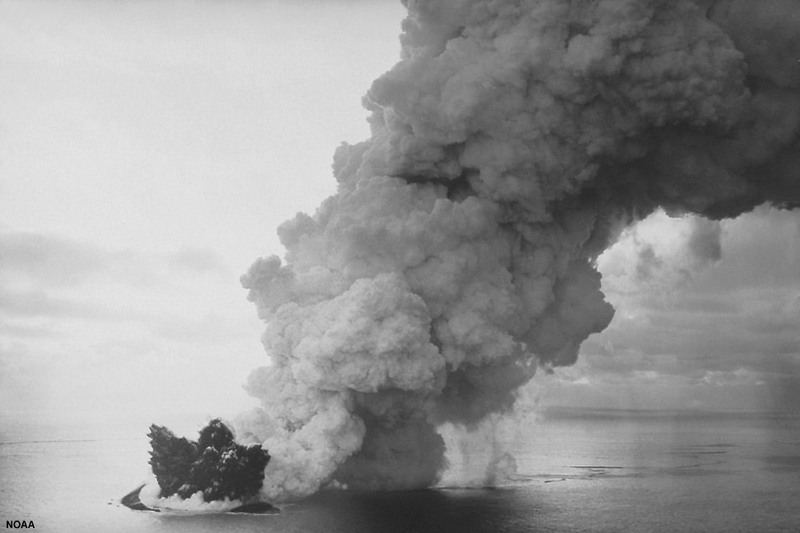 In most cases, Surtseyan eruptions occur when an undersea volcano has finally grown large enough to break the water's surface; because water expands when it turns to steam, water that comes into contact with hot lava explodes and creates plumes of ash, steam and scoria. Lavas created by a Surtseyan eruption tend to be basalt, since most oceanic volcanoes are basaltic. The classic example of a Surtseyan eruption was the volcanic island of Surtsey, which erupted off the south coast of Iceland between 1963 and 1965. 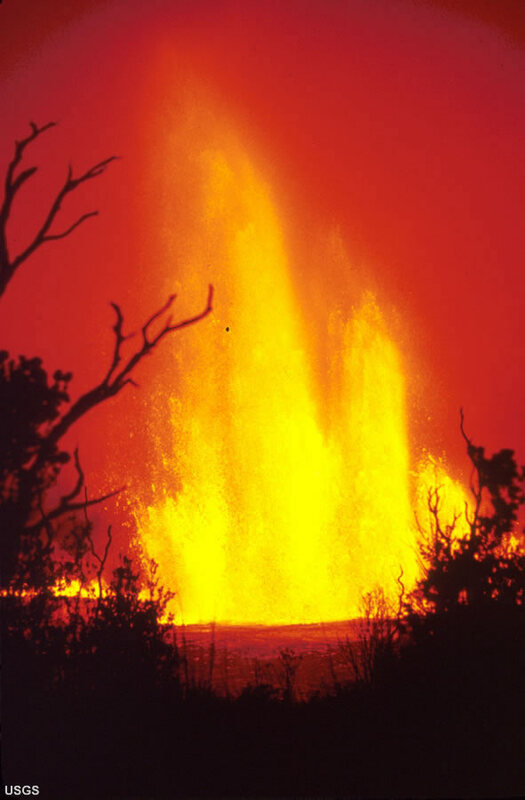 Hydromagmatic activity built up several square kilometers of tephra over the first several months of the eruption; eventually, seawater could no longer reach the vent, and the eruption transitioned to Hawaiian and Strombolian styles. More recently, in March 2009, several vents of the volcanic island of Hunga Ha'apai near Tonga began to erupt. The onshore and offshore explosions created plumes of ash and steam that rose to more than 8 km (5 miles) altitude, and threw plumes of tephra hundreds of meters from the vents. Bardintzeff, J.-M. and McBirney, A.R., 2000, Volcanology: Massachusetts, Jones & Bartlett Publishers, 268 p.
Schminke, H.-U., 2004, Volcanism: Berlin, Springer, 324 p.
McNutt, S.R., Rymer, H., and Stix, J. (editor), 1999, Encyclopedia of Volcanoes: San Diego, CA Academic Press, 1456 p.